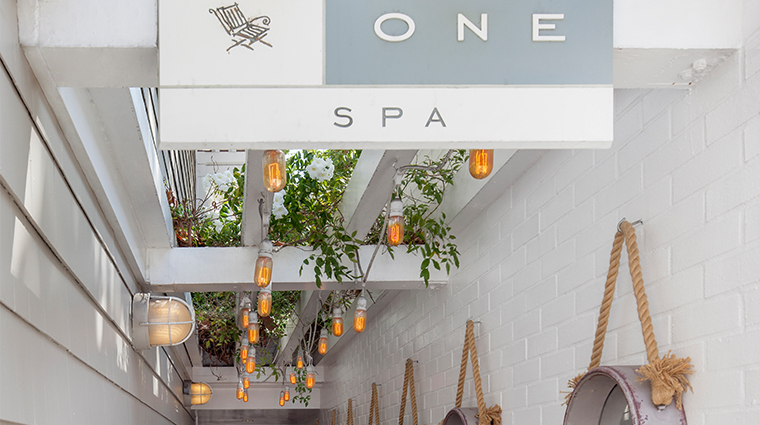 Located within the elegant Shutters on the Beach on the shores of the Pacific Ocean, ONE the Spa is a cozy, nautical-inspired (think portholes in the treatment rooms and a shell-adorned quiet room) 7,000-square-foot beachfront oasis in the heart of sunny Santa Monica. While the spa may be small, treatments created by high-end brands like Red Flower and Omorovicza prove this spa is serious about providing results-driven services in a serene and relaxing environment. The spa also boasts a state-of-the-art gym and a variety of activities ranging from yoga on the sand to surf lessons. • We love the 90-minute All In One massage, which incorporates a variety of modalities and is completely customized to your individual needs and preferences. • While there are not any specific couples treatments per se, any of the massages or facials at ONE the Spa can be done in one of the larger treatment rooms in order to allow room for two tables. • Comfortable spa apparel and indulging skincare products are available for purchase in the boutique. • Fresh fruit — often green or red apples — tea and both fruit-infused and regular bottled water await hungry spa-goers in the relaxation room. • Because the L.A. spa is so highly rated, appointments for its massages, body treatments and facials are in high demand. We recommend scheduling your service well in advance. • If your plans change — as often happens on a trip away from home — the spa staff requires that you cancel at least 12 hours before your appointment time. • While you have the option to request services via the Shutters on the Beach website, making a direct call lends you the expertise of the staff. • When it comes to the kinds of massages offered at ONE, the focus is on customization — not quantity. 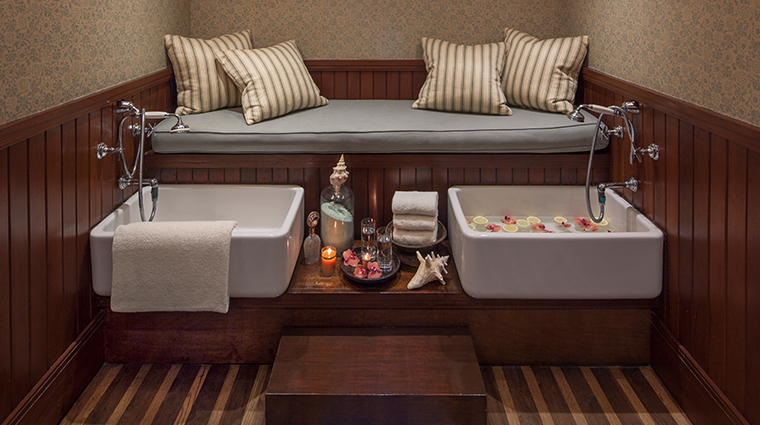 • If you select the As You Like It massage, you’ll make three choices to create your ideal treatment. First you’ll select an essential oil blend, followed by the type of massage and finally, the length of time. • The 90-minute red flower Hammam Detoxifying Treatment is the only wrap option at this California spa. The therapeutic ritual includes a stimulating citrus and coffee exfoliation, followed by a rhassoul clay wrap to draw impurities from the skin, ending with a massage and shea butter rub-down. • With a name like Chill Out, it’s easy to see why so many guests choose this invigorating facial. This signature beach facial is all about cooling off your skin after a day on the beach by using botanicals that will hydrate and soothe. • Another go-to service is the Red Flower Japan Treatment, which involves an exfoliating scrub, cherry blossom body buff and a shiatsu massage. A plum blossom silk cream is applied at the end. • The wet areas are not the most expansive, but they are relaxing and functional. • The locker room has a couple of showers and a steam room if you want to arrive early. There’s also a small vanity area inside the locker room used to wind-down. • We really like the relaxation den at the spa. It’s a cozy space but very serene with dim lighting and antique mirrored walls with woven panels covered in seashells. • Heading to the pool before or after your treatment is recommended for some additional rest and relaxation.